There’s something magical about harp music at a wedding. The sound of the plucked strings gives an air of elegance and beauty to your special event. The purpose of this site is to give you a taste of the possibilities for harp music at your wedding. Why not take some time and listen to each of the pieces (most are less than a minute). Imagine coming down the aisle to the sound of the harp. Is there a piece that particularly catches your ear, one that sounds like it would fit with your taste, with your idea of your wedding? Make a note of it, and when you’ve made your choices, contact me and we can discuss details. The prelude music usually begins 15 minutes before the actual ceremony, as a way of setting the mood. It signals to guests that the wedding is about to begin. The prelude music is comprised of selections from the standard classical harp repertoire. It is geared to each specific location and group so as to have the best effect possible. When it’s time for the entry of the bridal party, the prelude music comes to an end, and the officiant usually invites everyone to stand. Some brides prefer two separate pieces of music at this point, one for the bridesmaids and one for the bride herself. Others prefer one piece for the whole bridal party. Here are some samples of pieces you might consider for the procession. There are several places during the ceremony where harp music is appropriate. In a religious ceremony, music may be placed between the Bible readings, somewhere else, or during the administration of communion. In a civil ceremony it may be nice to have a moment of meditative music after the readings or after the officiant’s remarks. The signing of the register at the end of the service is always a good time for music as well. Consider the following for during the ceremony. Frequently the harp is paired up with a solo instrument such as the flute, the oboe or the violin. Here are some samples. What about accompanying a singer? The harp sounds beautiful accompanying singers. If you plan to have a soloist at your wedding, please chat with me first to be sure that the piece(s) your soloist would like to sing are actually playable on the harp. Most of the standard wedding repertoire works well with the harp, but let’s talk first before making a commitment to the soloist. It is essential that the soloist and I have a rehearsal before the day of the wedding. The music at your wedding should be the very best, and that requires advance preparation. I’m always happy to look at new music. If you have a particular piece of music in mind, let’s talk about it. Please remember that I am a classical harpist. I don’t usually play Broadway tunes or popular love songs (there’s nothing wrong with that music at your wedding, it’s just not something I do). If you have some special music that you’d like played on the harp at your wedding, please tell me about it and I’ll see what I can do to make it happen. There are a couple of special requirements for the harp at outdoor weddings. 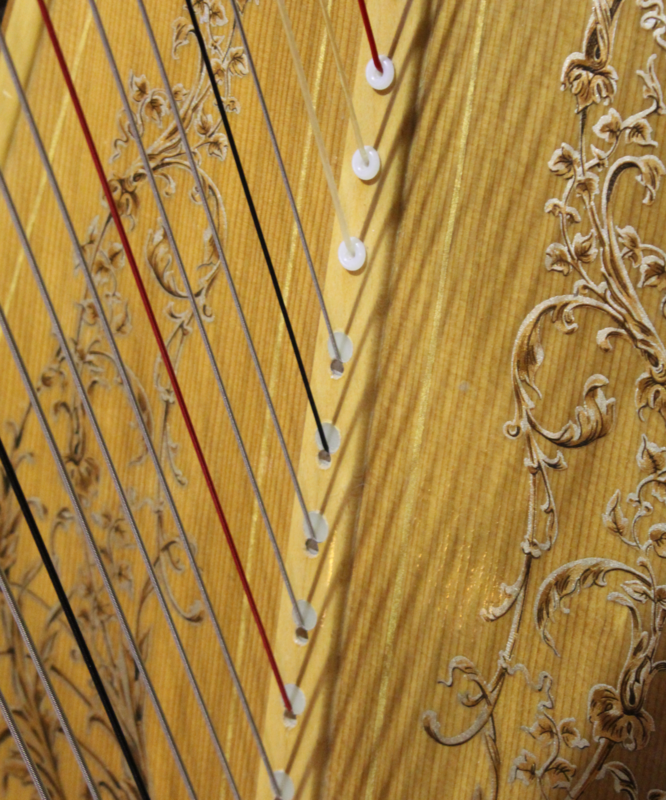 The harp must be situated on a hard, level surface such as a patio or deck; it cannot be on grass, gravel or sand. Often a 4×4 piece of plywood will do the trick. The harp needs to be located in a shady spot, one where the shade will not disappear as time passes. The harp cannot be in direct sunlight. A gazebo or awning is perfect for this. Remember to include relocating the harp in your rainy-day plans. Please feel free to contact me at gordon@gordonjohnston.ca. I love playing weddings, and would be happy to talk with you about harp music for your special day.